15 minutes play...BumbleBeans Inc.: Cecilia is inspired! Very challenging! Very exciting! I look forward to seeing your quilt! The lines and shapes in this one will make an interesting challenge. I love the way the little squares of the distant windows play off the curves of the bridge. Cool! Great perspective, and so much to play with. I have always loved bridges! And doors, I love doors too. 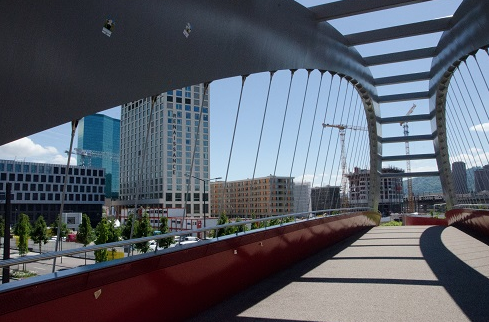 Thank you Victoria, for posting the picture.The lines and courves of this pedestrian/bicycle bridge in Zurich have really cought my eye! I am not shure yet, what I am going to do about!